One of my most popular blogposts is the series I did on the derivation of the Rayleigh-Jeans law, which I posted in three parts (part 1 here, part 2 here and part 3 here). I have had many thousands of hits on this series, but several people have asked me if I can do a similar derivation of the Planck radiation law, which after all is the correct formula/law for blackbody radiation. And so, never one to turn down a reasonable request, here is my go at doing that. I am going to split this up into 2 or 3 parts (we shall see how it goes! ), but today in part 1 I am going to give a little bit of historical background to the whole question of deriving a formula/law to explain the shape of the blackbody radiation curve. ‘Blackbody’ does not mean black! (which is the spectrum of a blackbody). The key word in this sentence is opaque. The opaqueness of an object is due to the interaction of the photons (particles of light) with the matter in the object, and it is only if they are interacting a great deal (actually in thermal equilibrium) that you will get blackbody radiation. So, examples of objects which radiate like blackbodies are stars, the Cosmic Microwave Background, (which is two reasons why astronomers are so interested in blackbody radiation), a heated canon ball, or even a canon ball at room temperature. Or you and me. Stars are hot, and so radiate in the visible part of the spectrum, as would a heated canon ball if it gets up to a few thousand degrees. But, a canon ball at room temperature or you and me (at body temperature) do not emit visible light. But, we are radiating like blackbodies, but in the infrared part of the spectrum. If you’ve ever seen what people look like through a thermal imaging camera you will know that we are aglow with infrared radiation, and it is this which is used by Police for example to find criminals in the dark as the run across fields thinking that they cannot be seen. The thermal radiation (near infrared) from a person. The differences in temperature are due to the surface of the body having different temperatures in different parts (e.g. the nose is usually the coldest part). Kirchhoff came up with his radiation laws in the mid-1800s, he began his investigations of continuum radiation in 1859, long before we fully knew the shape (spectrum) of a blackbody. We actually did not know the complete shape of a blackbody spectrum until the 1890s. And the motivation for experimentally determining it is quite surprising. In the 1880s German industry decided they wanted to develop more efficient lighting than their British and American rivals. And so they set about deriving the complete spectrum of heated objects. In 1887 the German government established a research centre, the Physikalisch-Technische Reichsandstalt (PTR) – the Imperial Institute of Physics and Technology, one of whose aims was to fully determine the spectrum of a blackbody. PTR was set up on the outskirts of Berlin, on land donated by Werner von Siemens, and it took over a decade to build the entire facility. Its research into the spectrum of blackbodies began in the 1890s, and in 1893 Wilhelm Wien found a simple relationship between the wavelength of the peak of a blackbody and its temperature – a relationship which we now call Wien’s displacement law. if the temperature is expressed in Kelvin. This will give the wavelength in metres of the peak of the curve. That is why, in the diagram below, the peak of the blackbody shifts to shorter wavelengths as we go to higher temperatures. Wien’s displacement law explains why, for example, an iron poker changes colour as it gets hotter. When it first starts glowing it is a dull red, but as the temperature increases it becomes more yellow, then white. If we could make it hot enough it would look blue. By 1898, after a decade of experimental development, the PTR had developed a blackbody which reached temperatures of 1500 Celsius, and two experimentalists working there Enrst Pringsheim and Otto Lummer (an appropriate name for someone working on luminosity!!) were able to show that the blackbody curve reached a peak and then dropped back down again in intensity, as shown in the curves above. However, this pair and others working at the PTR were pushing the limits of technology of the time, particularly in trying to measure the intensity of the radiation in the infrared part of the spectrum. By 1900 Lummer and Pringsheim had shown beyond reasonable doubt that Wien’s ad-hoc law for blackbody radiation did not work in the infrared. Heinrich Rubens and Ferdinand Kurlbaum built a blackbody that could range in temperature from 200 to 1500 Celsius, and were able to accurately measure for the first time the intensity of the radiation into the infrared. This showed that the spectrum was as shown above, so now Max Planck knew what shape curve he had to find a formula (and hopefully a theory) to fit. In part 2 next week, I will explain how he went about doing that. When we look at objects giving off light (or reflecting light) we find three types of spectra. They are produced in different ways, and can actually tell us about the physical properties of the materials producing the spectra. In many ways it was the development of studying and understanding the spectra of astronomical objects that led to the development of astrophysics as opposed to the more traditional astronomy. This happened from the mid 1800s. When Newton did his famous experiment with a prism and sunlight, he noted that the Sun produced a “rainbow” of colours. This is a continuous spectrum. (However, as I will discuss in a future blog, if he had been able to produce a more detailed spectrum he would have noticed some subtleties on this continuous spectrum). So, light from the Sun, and any star, produces a continuous spectrum. 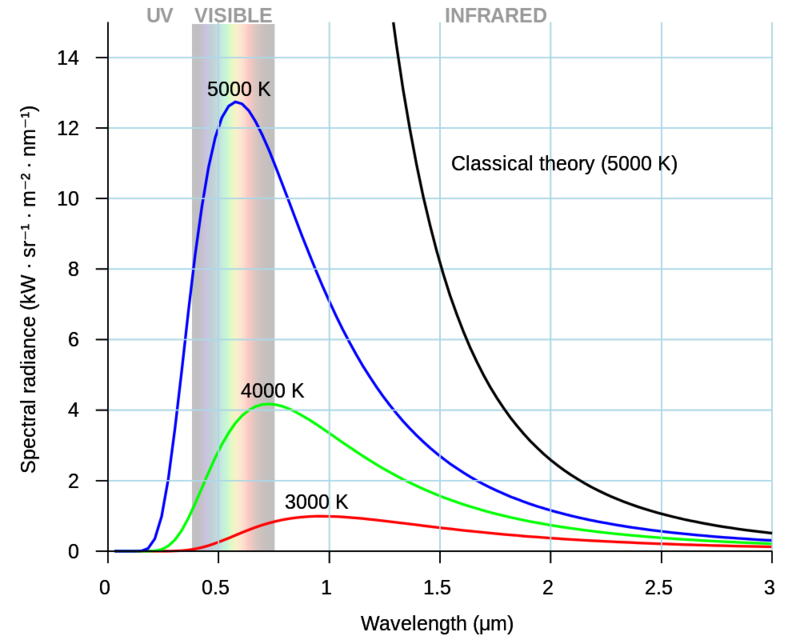 We also get a continuum spectrum from a hot solid, so for example the light produced by incandescent light bulbs is a continuum spectrum. These kinds of bulbs give off light by a very thin coil of metal, the filament, (usually tungsten) getting extremely hot from having an electric current passed through it. When the filament gets to thousands of degrees, it gives off light. If, instead of looking at the spectrum of the Sun we were to look at the spectrum of an object like Messier 42 (the Orion nebula), we would notice a very different kind of spectrum. Rather than being a continuous spectrum, we would see a series of bright lines with a dark background. We would also see an emission line spectrum if we were to look at the spectrum from one of the fluorescent light sources which are now replacing the incandescent lights in houses. 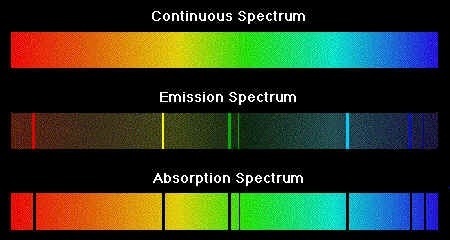 An absorption line spectrum is in some ways the converse of an emission line spectrum. 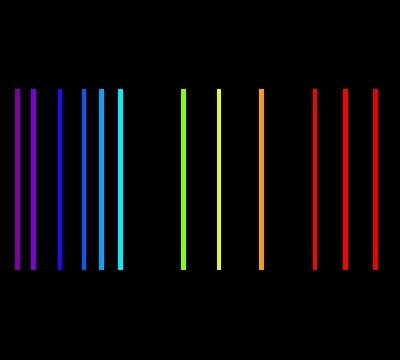 Rather than seeing a series of bright lines on a dark background, one sees dark lines on a continuous spectrum. 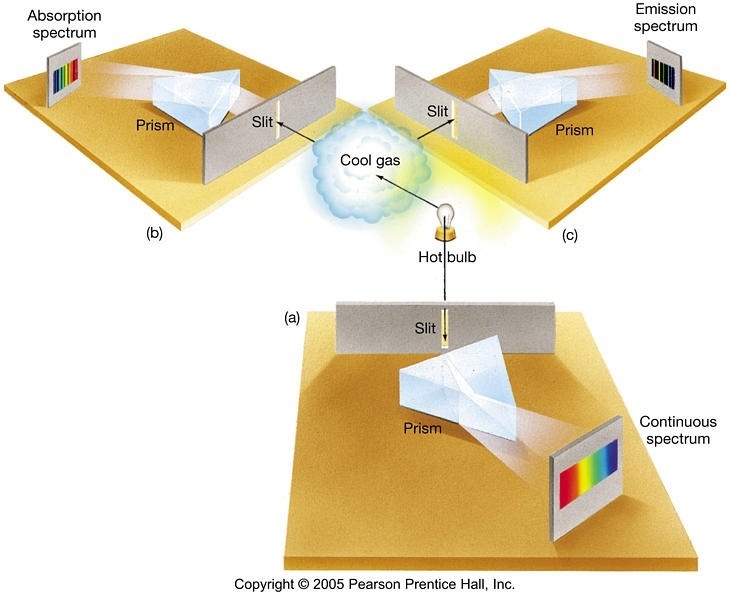 The diagram below shows how the three types of spectra can be produced. If we observe a continuum source (such as a star of an incandescent light) with nothing between us and that source then we will see a continuous spectrum. If, instead, we look at a gas cloud then we will see an emission line spectrum. This is why the Orion nebula has an emission line spectrum, because we are seeing the emission from the gas cloud from which the stars have formed and still are forming. The lines are in particular places on the spectrum which depends on the composition, pressure and temperature of the gas, as well as whether it is moving towards us or away from us. If we look at the same gas cloud but with a continuum source behind the cloud then we will see an absorption line spectrum. The dark lines are in exactly the same places (at the same wavelengths) as for the emission line spectrum, but are dark rather than bright. This was observed by physicists as early as the 1850s. In fact the diagram above is known as Kirchhoff’s radiation laws, after Gustav Kirchhoff (1824-1887), a German physicist of the time. He and Robert Bunsen (he of the eponymous burner) did important spectroscopy work in the 1850s and 1860s. But it was actually not until the 1920s that physicists properly understood the physics of these three different kinds of spectra. I will explain this physics in a series of future blogs. 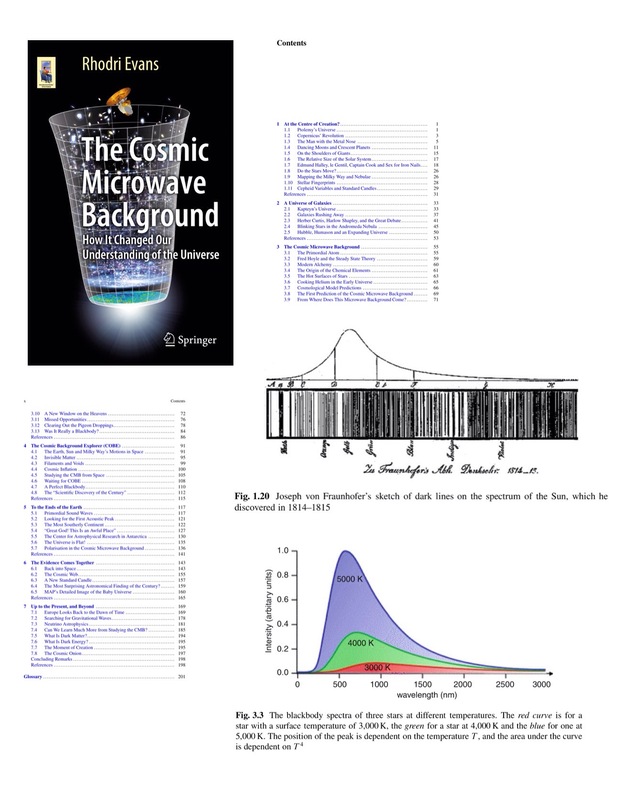 My book, “The Cosmic Microwave Background” includes Fraunhofer’s sketch of the first ever absorption spectrum seen of the Sun, and an explanation of why stars have different colours.